Today it is my turn to interview one prominent figure of our world. For this article we had to delegate our specialist in communication and social media, so it was obvious I should do the interview. But let’s get to the point. Data: Your Royal Highness could you, please, introduce yourself? Where were you born, when and from which race you descend? HRH Arlo: I was born on December 21st, 2012. Remember the uproar about the Aztec calendar and how the world would undergo a great change on that day? It was me, of course. My birthday is celebrated the world over. People hang up lights, decorate trees, my hairless ape slave even lights candles in what she calls a menorah for eight days. You really can’t miss it. I don’t remember where I was born. My vet doctor calls me a lavender because of my coloring and eye color, he also says that I am a cross between an Abyssinian and a Peruvian. HRH Arlo: This isn’t confusing at all really. The Guinea Pig Kingdom lies wherever guinea pigs are found. It’s not a place with borders. I am the King of all guinea pigs, no matter where that may be. The slaves have their own areas. They put borders around them and elect or appoint leaders over their burroughs. This shows the abject inferiority of the hairless ape slaves. They can’t handle living without border lines and must have someone to rule over them. No one seems to be able to rule them all, they are that out of hand, so each burrough has leaders and each burrough has its own sections with leaders in those areas. Such madness. The Tower is in a place the slaves call London. 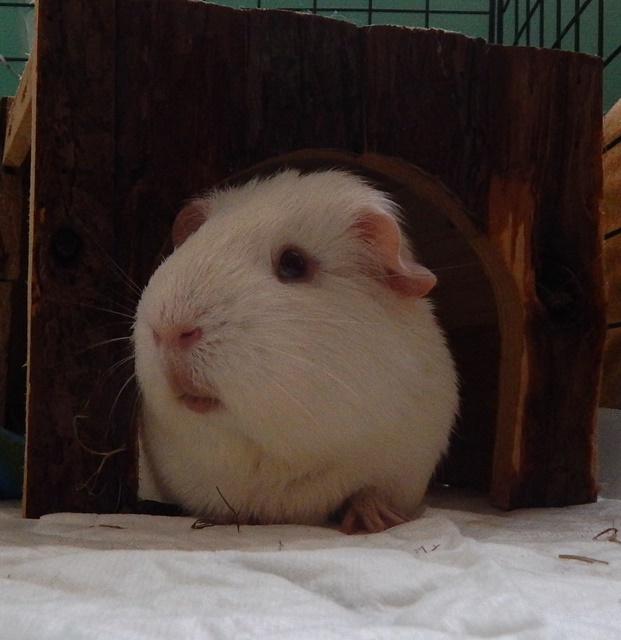 HRH Arlo: I am King of the Guinea Pig Kingdom. I have lots of duties. I hold court in my pigloo, I talk to my advisors. Last week, there was an attack on our kingdom. Bombs were going off for a week, culminating on the 4th . It was my duty to protect the royal residence and get our army ready for a counterattack. I attended talks with the heads of the other Kingdoms to discuss what should be done. The Rabbit King was there, the Kings of the Mice, Gerbils, Hamsters and so forth. I have a very busy life. I relax by demanding my slave scratch my belly and groom and massage my fur. Data: Let’s talk a little bit about your human. Every piggy has a human but I suppose your must be special. So how did you end up with your human and what do you think about her? HRH Arlo: You must be talking about the slave. My mother always told me I was special; meant for special things. She told me that a slave would be chosen to take me to my palace and care for me. When I was three weeks old I was given to my slave and placed in my palace with food, alfalfa, Timothy Hay, food and veggies and a bedroom in which to hide. A few days later I was taken to the vet doctor. I was not pleased but he gave me a full physical and dental check. He anointed me with a drop between my ears. He called it a protection from mites if I may have any. I can assure you I did not. My hairless, ape slave is adequate. She makes sure that my living quarters are clean and my bowl is always overflowing with food, my residence is always overflowing with hay and fresh water. I get plenty of fresh yummies everyday. When I am sick or need a mani‐pedi she promptly takes me to the vet doctor. More often than not I get my belly scratches, grooming and fur massages. She can be strange. Twice a day she rips off her fur and puts new fur on. Once a day, she rips off her fur and gets under a waterfall. She could drown! She says she’s grooming herself. Wouldn’t it just be easier to use her tongue like the rest of us do? This slave doesn’t have a lot of fur and every once in a while a friend of hers comes over and pours a liquid on her legs and her face around the fur above her eyes. Then the friend takes a cloth and rips the fur off of her legs and some around her eyes. 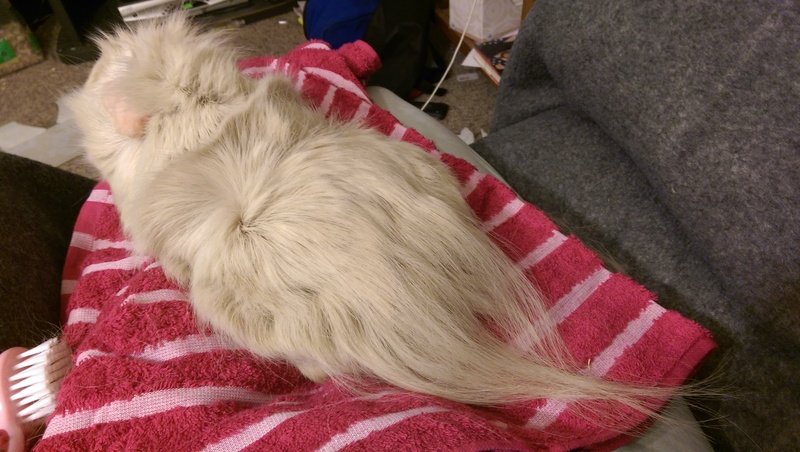 She gives this friend paper money or baked food to rip her fur out. Can you believe that? And sometimes she just talks into this box she puts to her ear. There’s no one there but she talks and laughs. She can be a strange one. Data: Was it hard to train your human to respond to your needs? HRH Arlo: Yes, and it still is. That girl can be so insolent. She’s stubborn as well. Do you know she will delay my royal breakfast so she can have a beverage called coffee? She often delays attention I want when she comes home just so she can unwind for five minutes. Insolence! When there are elections it is terrible. She will spend hours away working on what she calls campaigns. She comes in very late and delays my royal dinner. Sometimes she’s too tired to give me my royal belly scratches. She needs constant training. Data: Tell us a funny story about you and about your human. HRH Arlo: I have already talked about the human. I have many funny stories. I like to frustrate the slave. She will put our dinner in nice bowls. I like to wait until she’s watching and take my nose and tip the bowl over. She watches helplessly telling me that I better not dare and I look at her and tip it over. Just to see the look on her face. It’s priceless. I also remember when the vet doctor was testing me for a stone. He didn’t find one but I peed on his white coat to show him my dissatisfaction. The slave was so embarrassed. It was very funny. Data: How is it to share your human with 3 other piggies? What do you think about your cohabitants? HRH Arlo: I am not always happy about her attention to the others but they are part of the royal family and I simply have to insist that, for appearance sake, the royal family be treated as a royal family should. I think Barry is a troublemaker. He is older and abdicated the throne as he realized I was more fit to be King. He wanted to spend his time on more frivolous things. He is good at keeping the others in line but he also tells them they don’t have to fear me and that is just unacceptable. Garfunkel is very young and still not very mature. He was abandoned as a baby so he follows Barry everywhere. Barry is a mentor for him. Garfunkel needs to pay more attention to his cleanliness. The slave has to bathe him constantly. He’s a typical teenager. Daltry is well‐mannered but quite insecure from having so many homes. He is very cultured but very neurotic too. Data: How about sharing your residence with Daltry? HRH Arlo: I was not happy at first because I didn’t want to share the royal residency. The slave explained that he was lonely. Barry and Garfunkel have each other. Then I saw the small living quarters in which he arrived. No pig in the royal family will live like that. I acquiesced. It’s been a challenge but he grooms me and there is now twice the food, water, hay and yummies. Plus, I hear that Daltry has a sizable trust fund. That could be useful. Data: How about an heir to your kingdom? Tell us more about your love life. HRH Arlo: I had one great love. Her name was Ethel Rose and her beauty and grace were beyond compare. Leisa Eman was her slave. She became my Queen. Sadly, she passed away; she was a few years older than me. I have ordered statues erected throughout the Kingdom in her honor. At this time, I cannot foresee loving another. She bore me twins: Esther and Enoch. They have married and moved out. I hear from them often. Enoch has his own militia over which he reigns as general so it seems that when the time comes, Princess Esther will take over my throne. When we were together we took many trips and I showered my sow and pups with many gifts using the slave’s plastic money. Data: What is your favorite food and activity? HRH Arlo: I love watermelon and cantaloupe. It’s yummy. My favorite activities are my nightly snuggles and belly scratches. After a long day of ruling the Kingdom, a fur massage makes all the difference. When I am ready to go to my royal quarters, I simply pee on the slave to let her know. Data: Anything else that might interest our readers? HRH Arlo: Everything I do would interest your readers but there are things I must keep private for Kingdom security. 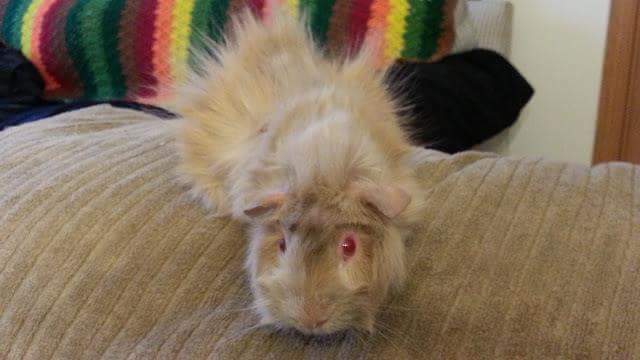 I will say that after the hairless, ape slave called me spoiled, I looked it up and I encourage all guinea pigs in the Kingdom to demand spoiling. It’s wonderful. 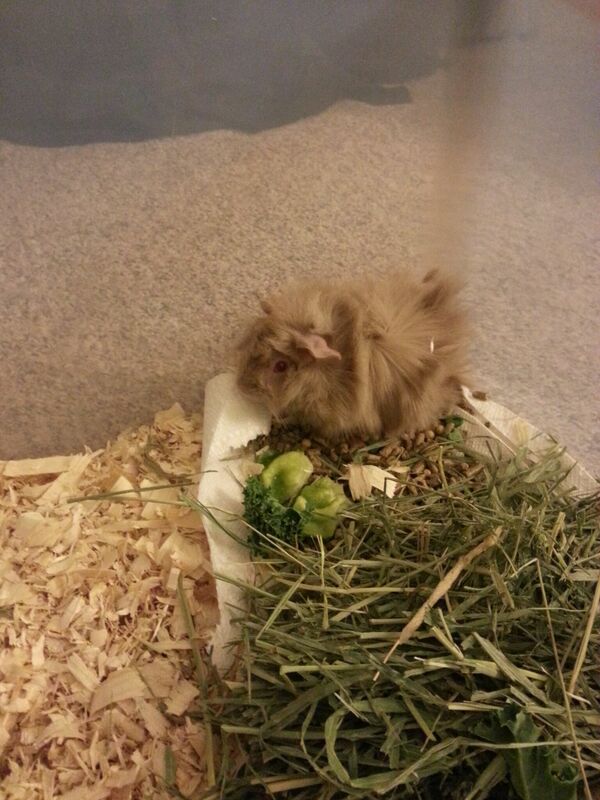 The wheeky pig gets the food so remember to wheek loudly. HRH Arlo has a very interesting hairdo, as you can see from the pictures below. But I supose a King has to have something different than the rest of us. Stay tune for another fabulous interview next Monday!